Netflix is riding this Ted Bundy wave all the way, controversy be damned. It wasn't long ago that a docu-series about the infamous serial killer took some heat for glorifying the man who many found to be extremely attractive. The network's response to this was to pick up the Sundance film Extremely Wicked, Shockingly Evil and Vile which stars the painfully-unattractive Zac Efron as Bundy and is directed by Joe Berlinger, the guy responsible for the aforementioned doc. The film had a ton of buzz at Sundance for Efron's performance as the killer, who committed dozens of murders across multiple states in the 1970s. 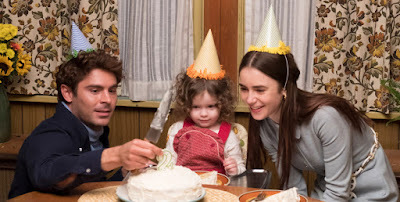 The whole time he was hiding his dark side from his partner, Elizabeth (Lily Collins), and the film is about her slow realization of Bundy's true nature. I attended the premiere and came away disappointed, wishing it had focused less on Bundy's dull courtroom battles. But Netflix is clearly positioning the film as a horror keeping in line with their plethora of true-crime content, and I think that's the best way to market it to those specific subscribers. Also starring Kaya Scodelario, Jeffrey Donovan, Angela Sarafyan, Dylan Baker, Brian Geraghty, Terry Kinney, Haley Joel Osment, James Hetfield, Grace Victoria Cox, Jim Parsons, and John Malkovich, Extremely Wicked, Shockingly Evil and Vile hits Netflix on May 3rd.